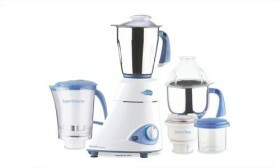 Cook healthy and delicious food with the help of Preethi Blue Leaf Platinum smart mixer-grinder. Its powerful 750 Watts motor and high quality Stainless Steel blades grind fine pastes and mix ingredients perfectly. Use this appliance to prepare smooth gravies, chutneys, fine spice powders and a lot more. This compact Preethi Blue Leaf mixer-grinder will help you make tasty food by whipping up everything you put in it to perfection. 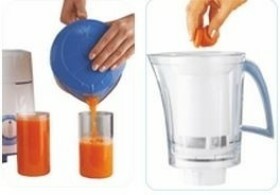 Made of durable material, the jars are easy to hold, remove and clean. Efficient and powerful, this food processor from Preethi Platinum is a great kitchen companion for you. It is a multifunction processor featuring two 100% stainless steel jars with flow breakers, a super extractor jar, and a chutney jar with a big bottle. It is made of high grade Neoprane and Delrin Couplers for smooth operation. The sturdy and ergonomically designed handles make it easy for you to use the processor. 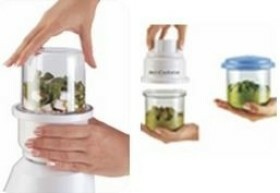 The Super Extractor Jar completely extracts fruits. The pulp stays in the filter, so that you can pour out the juice easily. You can prepare up to 3 glasses at a stretch. Grind and store chutneys, spices and coffee easily, by simply using the chutney jar. Store the ground contents in the airtight container (0.3/4 liter) and refrigerate as you serve repeatedly. The processor consumes 750 watts of power and runs on 230 Volts. The food processor comes with sealed oil-filled Sintered Bronze Bushes to render the bush durable. This processor is equipped with safety features such as a heat sensitive cutoff that protects it against voltage fluctuation and overload. The ABS (Acrylonitrile butadiene styrene) body of the processor makes it shock-resistant and rigid, making it easy for you to use it. It also comes with PVC (Polyvenyl Chloride) insulated 3 core flexicord with 6 Amps plugtop and earthing that prevent the processor from shot circuit or overload. The food processor has a 1.7 liter S.S Jar , a 1.25 liter S.S Jar , a 1.5 liter Super Extractor Jar , and 0.4 liter Chutney Jar with a big bottle.